We should always be careful, as runners and athletes, when shopping around for new data to help us develop our craft. We should be even more careful when this data comes in a convincing format—scientific research—and alarm bells should go off when that research isn’t put in context. Recently, I went to take the Pose Method Level 1 coaching certification, which I wrote a pretty popular review about. With this post, I want to begin diving a little deeper into the subject, starting by addressing one of the major scientific critiques towards the outcomes of minimalist running, forefoot striking, and the Pose Method: that these techniques are less efficient than heel-striking—namely, that they use more energy across the same distance. Well, do they? Perhaps. Most likely, in fact. However, seeking sheer reductions in energy use may be missing the point. Let’s take a popular sport as an example: mountain biking. One of the first things you consider when buying a new mountain bike is whether you want dual suspension, or only on the front. This is a classic trade-off: the dual suspension lets you go on more rugged terrain, but it also means that less power from every stroke goes into driving the bike forward. A dual-suspension bike is less efficient than a front suspension bike. That’s it, right? Front suspension bikes are superior. It’s a done deal. Before I go on, let me be quite clear about the argument that I’m making. I’m not saying that less efficient options are better. I’m arguing that different options can’t—and shouldn’t—be judged on efficiency alone. I’ve seen it at least a few times in the running community: the studies on whether the Pose Method lowers running efficiency are presented in one stand-alone sentence, as if by itself, and without regard for the scope and depth of functions that the human body must fulfill, efficiency means something. Efficiency alone means nothing. The questions we should ask is: what is it getting us, and what are we sacrificing by pursuing it? Let’s go back to the mountain bike example. Adding that rear suspension increases the capability of the bike to interact with more rugged terrain. If you land from a high jump with a dual suspension bike, you’re less likely to break the frame—or yourself. 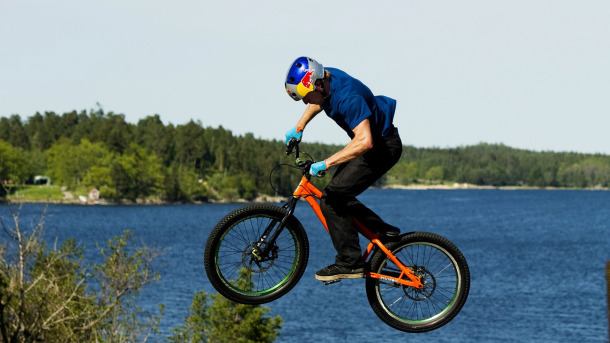 Not a mountain bike, but I’d say that Danny MacAskill’s legs count as suspension 1 and 2. You’ll see this across all systems: increasing the dynamism of any system (which means both its capability to interact and its rate of interaction) increases its ability to interface with other complex systems (i.e. the environment). In order for this to happen, a dynamic system has to be working with sufficient moving parts, all of which take energy to function. If we just focus on cost-cutting measures—what gets me the least energy consumption, all else aside—we’re going to be undercutting that system’s optimization at some point. That certainly seems to be the case in human locomotion, as suggested by this study (also cited above). We’re making a very specific—and very generalizable—trade by adding a rear suspension to the mountain bike: we’re reducing its efficiency in order to optimize it to the environment. Lowering the efficiency, however, does not immediately mean that you’re optimizing something. In fact, it’s typical to find that if optimization drops below a certain threshold, so does efficiency. A bike needs intact tires to function well. You can’t be riding on the rims during a race and expect to be very efficient. Optimization, although more costly in the immediate term, is more cost-effective than hard-edged efficiency over the long-term. What happens if the bike frame breaks? The amount of power that goes from your downstroke and into the ground drops to zero. We all live in this compromise: we want to increase our efficiency, but not at the cost of optimization. Let’s use a gait example. Is it more efficient to shut off your gluteus maximus, hamstrings and quads while running? Probably—those muscles are huge. They’re consuming lots of sugar and oxygen in order to stabilize the pelvis and move it over the femur and the knee joint. In addition, they’re mostly only active from contact to midstance. They’re the biggest muscles in the body, and they don’t even help you push off. Less efficient? Sure! Why not just let momentum carry your GCM—general center of mass—over your knee joint while keeping the hip extensors quiet? Because your femur would summarily come off your tibia, and your patella would pop off and land somewhere on the ground in front of you. Once again, the efficiency of your gait would drop to zero. I’m not making an argument for any particular method or stride type. (I believe those arguments are there to be made, once we have satisfactorily defined what we mean by “stride type,” but not in this post). The takeaway, as I mentioned above, is that in order to optimize something to the environment—say, in order to allow our body to remain in a configuration which can adapt its footfalls to variable terrain—we’re going to be sacrificing some raw efficiency. Is forefoot-striking or Pose the best way to optimize the body? Well, that’s a different question. UPDATE: In this article, “Pose” refers to excellent pose technique. (This was brought up by a concerned reader on a Facebook thread.) Indeed, all running and all movement is an alternation of poses (think about the kata in martial arts). For better or worse, the question remains in the scientific and running communities: is excellent Pose technique the best way to run? Many try to detract from it by saying that it is less efficient. I believe that regardless of whether it is or not, that line of argument largely misses the point.